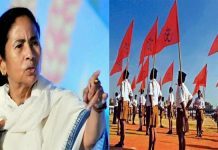 Kolkata: In a murky mudslinging between two elected heads, Chief Minister Mamata Banerjee has now called Prime Minister Narendra Modi the “master of all thieves” whose “hands are stained with bloods” from Gujarat riots. She has also maintained that “Rafale Deal is a huge scam” and that she is “fully with the Congress” on the demand for an independent probe into the deal. 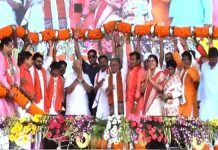 The comments came within hours of the PM asking from a public rally at Maynaguri in north Bengal as to why the CM sat on dharna to protect the accused in chit-fund scams. Bypassing the state government, the PM today also inaugurated the Jalpaiguri Circuit Bench of the Calcutta High Court, adding to the hostility. “He is the master of all thieves. 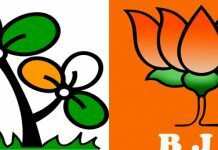 In his regime all the corrupt persons have joined the BJP,” a furious Banerjee said addressing a Press conference after the Bengal Global Business Summit in New Town. Referring to a news report in The Hindu today that claims the Prime Minister’s Office interfered in Rafele Deal, Bengal CM alleged that PM Modi interferes in the work of every single Union minister and has even tried to meddle in the matters of the states. “But you cannot fool all the people all the time. I don’t know the nitty-gritty of the Rafale Deal but something must have happened behind the scenes. There’s something surely wrong: Rafale Deal is a big scam. We fully support the views of the Congress on this because they have the papers,” she said. Addressing the PM as “Rafale Babu”, Banerjee countered that she had sat on a “Satyagraha” to save the country and the Constitution. She alleged that the Centre rakes up the chit-fund scam before every election while it kept mum on the matter for the last five years. “Don’t try to browbeat Mamata. What you have done in Tripura with by splurging money is not possible in Bengal. When anyone challenges me, I become more energised,” Banerjee thundered. On the issue of the Circuit Bench inauguration, the CM said that her government will write to the Supreme Court asking as to how the Centre could bypass the state and the Calcutta High Court. “I am a political person, but doesn’t the Circuit Bench belong to Calcutta High Court? Was anyone from the High Court present today? Neither the High Court nor the state government was kept in the loop,” she maintained. Banerjee said that it is the state that gave land and spent Rs 300-crore to build the Circuit Bench. Despite everything being ready three months ago, the Centre did not issue the necessary notification for inaugurating the Circuit Bench. “Neither bride nor the bridegroom was present today. They brought in hired band party for the inauguration in a bid to beat their election drums,” she said. On being asked about Centre’s reported move to strip the medals of five senior IPS officers for attending her anti-CBI dharna, the CM said that the Centre doesn’t have the authority to do so. “Police officers are under the state government not under the Central government. It is the authority of the state. The Centre has no moral authority; they cannot take action against our police officers. Law and order is under the purview of the state,” Banerjee maintained.